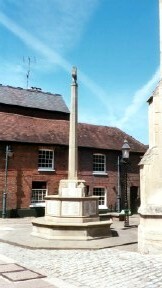 The memorial is situated in front of church of St Peter High Street. There are 8 sections around the base of the memorial. Lieutenant, 5th Battalion, Oxfordshire and Buckinghamshire Ligth Infantry. Killed in action 16th June 1915. Aged 27. Son of Julius and Elizabeth Berlein, of Johannesburg. Born at Kimberley, South Africa. Buried in VLAMERTINGHE NEW MILITARY CEMETERY, Ieper, West-Vlaanderen, Belgium. Plot II. Row A. Grave 2. 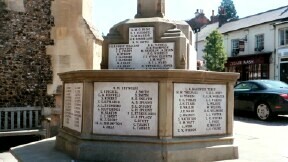 See also Charterhouse school Memorial. Volume 1, Part 1, Page 32 BERLEIN, Charles Maurice, Lieutenant, 5th (Service) Battalion Oxford and Buckingham Light Infantry. Eldest son of Julius Berlein of Cross Oak, Berkhamsted, co Herts, J.P. Born Kinberley, South Africa 4-5-1888, educated Charterhouse and New College, Oxford (B.A. 1910). Was engaged in chemical research and was in charge of a laboratory, but on the oubreak of war received a commission as temporary Lieutenant in the Oxs & Bucks L.I. 22-8-14 and fell in action near Hooge 16-6-15 leading his men through a heavy shrapnel fire, a few paces from the enemies trenches. Lieutenant, 8th Battalion, Princess Charlotte of Wales's (Royal Berkshire Regiment). Killed in action 25th October 1915. Aged 22. Son of Julius and Elizabeth Berlein, of Johannesburg, South Africa. Buried in DUD CORNER CEMETERY, LOOS, Pas de Calais, France. Plot V. Row D. Grave 7. 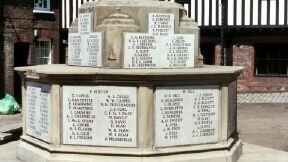 See also Charterhouse school Memorial. Volume 1, Part 1, Page 32 BERLEIN, Leslie Herman, Lieutenant, 8th (Service) battalion Royal Berkshire Regiment. Youngest son of Julius Berlein of Cross Oak, Berkhamsted, co Herts, J.P. Born Johannesburg, South Africa 30-6-1893. Educated Charterhouse, Berkhamsted school and Magdelene College, Cambridge, was a member of Lincolns Inn, but following the outbreak of war was gazetted temporary Lieutenant in the Berkshires 19-9-14. His battalion was selected to lead the attack near Hulluch on 25-9-15. 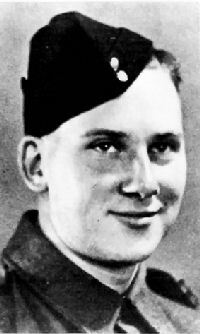 In the assault his company was leading, and, Lieut Berlein was the first out of the trenches. He was killed on the front of the enemies trenches leading his platoon. Private 265430, 1st Battalion, Hertfordshire Regiment. Killed in action 31st July 1917. Aged 31. Born, resident and enlisted Berkhamsted. Son of William and Lizzie Harrowell, of Clarence Cottage, Clarence Rd., Berkhamsted, Herts. ; husband of Florence Harrowell, of 25, Queen's Rd., Berkhamsted, Herts. No known grave. Commemorated on YPRES (MENIN GATE) MEMORIAL, Ieper, West-Vlaanderen, Belgium. Panel 54 and 56. Served as LEWIS. Lance Corporal 55366, 55th Battalion, Machine Gun Corps (Infantry). Killed in action 6th May 1918. Aged 34. Born Berkhamsted, enlisted Ealing, resident Hanwell. Son of William and Lizzie Harrowell; husband of Ada Jane Harrowell, of Clarence Cottage, Clarence Rd., Berkhamsted, Herts. Formerly 42328, Royal Fusiliers. No known grave. Commemorated on LOOS MEMORIAL, Pas de Calais, France. Panel 136. Second Lieutenant, 10th Service Battalion, Sherwood Foresters (Nottinghamshire & Derbyshire Regiment). Killed in action near Zillebeke, Flanders 8th September 1915 by a sniper. Aged 18. Son of Robert and Jane Symington Hutcheson, of "Annandale," Cross Oak Rd., Berkhamsted, Herts. Buried in HOOGE CRATER CEMETERY, Ieper, West-Vlaanderen, Belgium. Plot V. Row H. Grave 9. Volume 1, Part 1, Page 199 - HUTCHESON, John, 2nd Lieut, 10th (Service) Battalion, Sherwood Foresters (Notts & Derby Reg). Eldest son of Robert Hutcheson, of Annadale, Berkhamsted, and Mincing Lane E.C, Sugar Broker, by his wife Janey Symington, dau of the late John Henry Downes of 18 Athole Gardens, Glasgow and grandson of the late John Mitchell Hutchesonof Greenock. Born, Highbury London, 31-1-1897, educated Berkhamsted School, where he was from 1906-1914. The last three years he was a member of the O.T.C. On leaving schoolhe entered the offices of the Clerical, Medical and General Life Assurance Society, but after the outbreak of war left in the beginning of Oct to join the Inns of Court O.T.C. From this he was gazetted 2nd Lieut to the 10th Battn of the Sherwood Foresters 3-10-1914 and was killed in action near Zillebeke, Flanders 8-9-1915 by a sniper while surveying his fire trenches. He was buried in the Sanctuary Wood, near Ypres. Many letters were received from his superior and his brother officers, all testifying to the regard and affection in which he was held. His Colonel wrote " He was a keen and energetic officer of considerable promise and popular with all ranks." His Captain "It is the first life lost among our oficers and it is one of the best that has gone......He was absolutely clean and honourable, frank, sincere and fearless". His Orderly wrote " I write this short letter out of respectto my esteemed officer, your son. It is a very sincere blow to me to lose him, for he was the very best friend that I ever had out here, and although I was only a Tommy he showed every consideration for me as well as the other men in the platoon, he was very much esteemed. He was buried with full honours and his grave is in a wood with others. There is a cross at the head and I shall do all I can to keep his grave clean." The doctor wrote "A more unselfish boy one could not find, always thinking of the well being of others.............I chose his resting place. 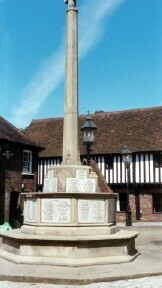 A plain wood cross has been erected 'In loving memory of 2nd Lieut J. Hutcheson, killed in action', and the motto ' to live in hearts we leave behind, is not to die'." Captain, 2nd/5th Battalion, Bedfordshire Regiment. Killed in action at the Somme on 24 April 1918. Age 22. Son of John Best McBride and Mary Constance McBride, of Falkland House, Berkhamsted. Awarded the Military Cross (M.C.). Buried in LONGUEAU BRITISH CEMETERY, . PLot I. Row C. Grave 9. Private 1510, 1st Battalion, Honourable Artillery Company (Infantry) (Stretcher Bearer Section). Killed in action by a shell 17th June 1915. Aged 22. Enlisted Armoury House, resident Berkhamsted. Son of J. D. and Jane Naismith Sprunt, of Montgomerie, Berkhamsted, Herts. Commemorated on YPRES (MENIN GATE) MEMORIAL, Ieper, West-Vlaanderen, Belgium. Panel 9. Volume 1, Part 1, Page 336. SPRUNT, Edward Lawrence. Private, number 1510, 1st Battalion Honourable Artillery Company (Stretcher Bearer Section). 3rd son of John Dalziel Sprunt of 3 East India Avenue, London E. C. and Montgomerie, Berkhamsted by his wife Jane, dau of John Naismith. Born Hamstead, London, 28-8-1892, educated Berkhamsted school and Jesus college, Oxford, at which latter he held an open exhibition. Having served about 9 years in the O.T.C. he was offered a commission on the outbreak of war, but being eager to go the front as soon as possible, and thinking he would probably be sent for months to a Regimental depot to train recruits (as his elder brother was) he enlisted as a private in the H.A.C. and went to the front with them and served through the winter of 1914-15. Later was again offered a commission and the war office instructed his Colonel to send him home, that he might take it up. After getting his discharge he went back to the Colonel and said that he had heard there was to be a battle the next day, and as he did not wish to leave on the eve of it, he asked permission to remain and see his comrades through it. The Colonel replied that as he had put it so gallantly, he could not refuse his request, and so he might remain. That evening the battalion went up to the trenches and was under fire about 36 hours, including the fierce fight of 16th June, 1915, losing about half its numbers. 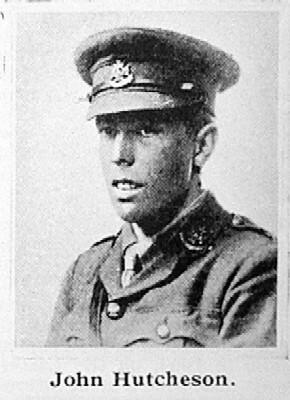 On 17th June, about 2am, near Chateau Hooge, Belgium, he was helping to carry a wounded comrade on a stretcher, and had got within about 15 yards of the dressing station, when a shell came over and exploded underneath the stretcher, killing him and two others, wounding the remaining two stretcher bearers. He was buried on the battlefield near the Ypres-Menin road and was unmarried. His commanding officer wrote "Your son had the opportunity of not going up (to the trenches) and of returning home, but refused to leave his comrades at such a time, and showed a magnificent spirit.......worthy of a man of this Regiment. The circumstances were such as to lead me to specially recommend him for gallant conduct, and the enclosed card has been received from the General. I have pleasure in sending it to you, while regretting very much the circumstances which have been greatly appreciated by his comrades." The card is of the first class, being printed in gilt letters, the ordinary card being in black letters, it reads "Third Division Expeditionary Force, 1510, Private E. L. Sprunt, Honourable Artillery Company, your commanding officer and brigade commander have informed me that you distinguished yourself by your conduct in the field on the 16th June, 1915. I have read their report with much pleasure and have brought it to the notice of higher authority." Later the Assistant Military Seceratary wrote that he had been mentioned in a despatch from F.M Sir John French "For gallant and distinguished service in the field." "I am to express to you the Kings high appreciation of these services, and to add that His Majesty trusts that their public acknowledgment may be of some consolation in your bereavement". Serjeant 5990091, 2nd Battalion, Essex Regiment. Killed in action near Venray, Holland, 23rd November 1944. Aged 23. Born at Berkhamstead in 1921. 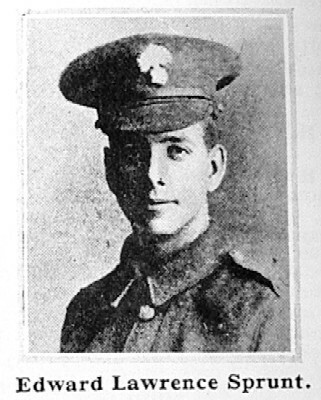 Son of Arthur and Louie Flint of 19, Castle Street, Berkhamstead. Educated at Victoria School. Employed in the offices of John Dickinson's, Apsley. Joined the Territorial Army shortly before the Seond World War. Married Barbara Jill Edney in 1942 at St, John's Church, Boxmoor. Buried in VENRAY WAR CEMETERY, Limburg, Netherlands. Plot IV. Row D. Grave 5. Private 5832590, B Company, 2nd Battalion, Cambridgeshire Regiment. Died as a prisoner of war at Longi 62K of dysentery 3rd June 1944. Aged 31. Son of Charles Henry and Lucy Priscilla Foskett, of Berkhamsted, Hertfordshire. Buried in Thanbyuzayat War Cemetery, Myanmar. Plot B1. Row O. Grave 15.